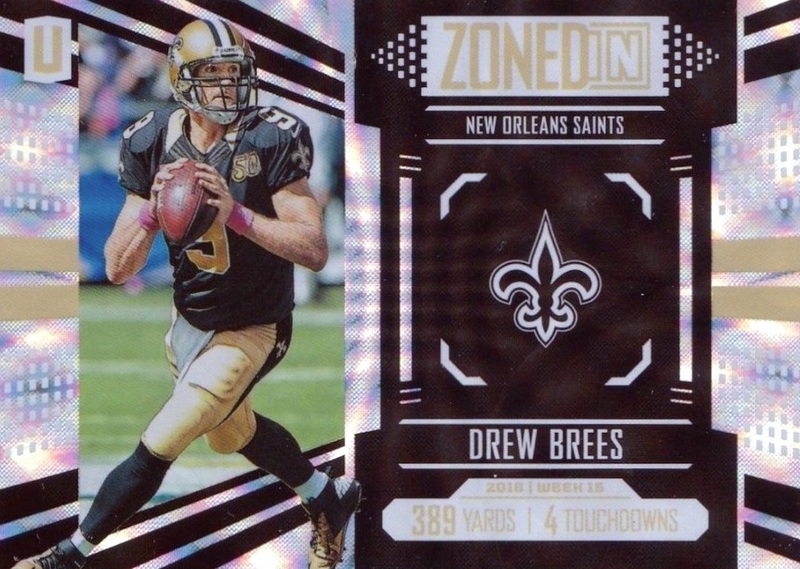 2017 Panini Unparalleled Football is the sophomore effort for the NFL brand that again goes with a theme reminiscent of a kaleidoscope. 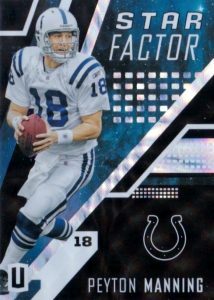 Bringing shine, sparkle and bright colors to collectors, two autographs and one relic card emerge from every hobby box. The 2017 yield flips the script from the 2016 set, which promised one autograph and two relics. Each box should also contain at least seven numbered inserts or parallels. 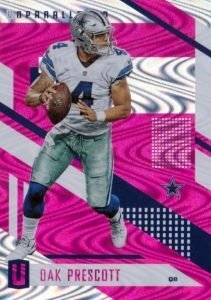 Taking a unique approach to NFL designs, the 200-card set includes "the first-ever base cards of more than 60 veteran players," and adds 100 rookies. A flood of parallels comes with it—10 in total—including Red, Gold and Lime Green. There are also inserts that fall in every pack. Matching the base rookie subset in size, the Rookie Autograph insert includes up to 100 subjects with eight parallels. 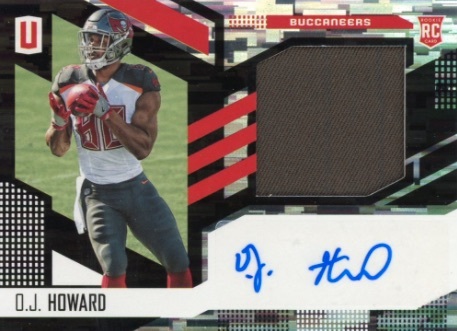 Applying a jersey swatch to the horizontal layout, the Rookie Jersey Autograph set also offers eight parallels, with print runs of 149 copies and less. 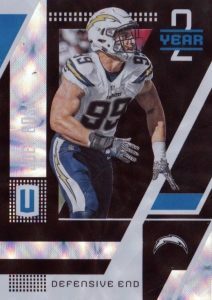 Although the first-year players are prominent within the 2017 Panini Unparalleled Football autograph checklist, other choices, like the High Flyers Signatures, highlight additional players from the league. 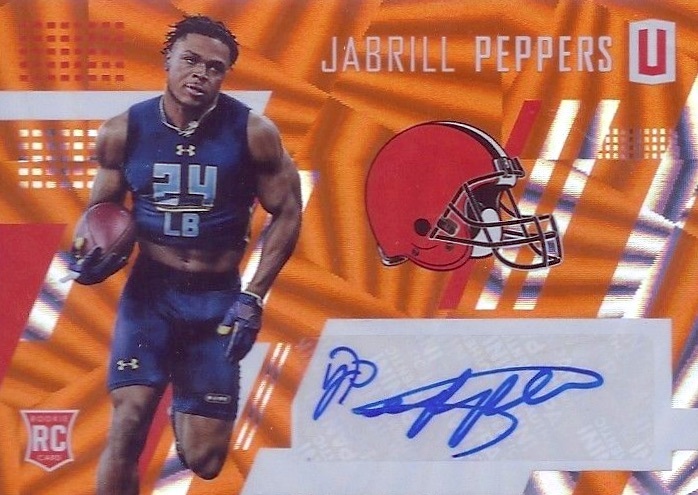 The '17 NFL Draft class is also a huge part of the memorabilia inserts in 2017 Panini Unparalleled Football. Rookie Stitches comes in Dual and Jumbo relic form, with plenty of low-numbered parallels. This includes a one-of-one jumbo Shield version. Meanwhile, the vets move into focus with Zoned In Memorabilia cards celebrating the stars of 2016. 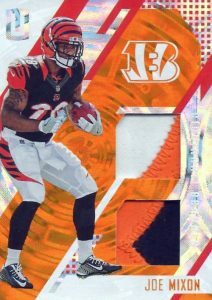 Finally, 2017 Panini Unparalleled Football contains Brand Logo, NFL Shield and Tag memorabilia cards for the new rookies. Some autographs only found through Panini Rewards. PARALLEL CARDS (#1-200): Lime Green, Pink, Yellow #/199, Purple #/99, Orange #/49, Teal #/25, Red #/15, Blue #/10, Green #/5, Gold 1/1. ROOKIES PARALLELS (#201-300): Lime Green #/499, Pink #/299, Yellow #/199, Purple #/149, Orange #/99, Teal #/49, Red #/25, Blue #/15, Green #/5, Gold 1/1. 95 cards. Shop on eBay. PARALLEL CARDS: Yellow #/149 or #/49, Purple #/99 or #/25, Orange #/49 or #/15, Teal #/25 or #/10, Red #/15 or #/5, Blue #/10 or #/3, Green #/5 or #/2, Gold 1/1. PARALLEL CARDS: Purple #/99 or less, Orange Patch #/49 or less, Teal Patch #/25 or less, Red Patch #/5, Gold NFL Shield 1/1, Green NFL Shield Tag 1/1, Blue Size Tag 1/1. PARALLEL CARDS: Lime Green #/199, Pink #/99, Purple #/49, Orange #/25, Teal #/15. PARALLEL CARDS: Blue #/10 (Sharpe, Ward - #/25), Green #/5 (Sharpe, Ward - #/10), Gold 1/1. 13 cards. Serial numbered #/25. Shop on eBay. PARALLEL CARDS: Blue #/25, Patch Green #/25, Tag Gold 1/1. *Jackson/Evans only in Tag Gold parallel. 40 cards. Serial numbered #/199. Shop on eBay. PARALLEL CARDS: Purple #/99, Orange Patch #/49, Teal Patch #/25, Red Patch #/10, Green Brand Logo 1/1, Blue Nike Laundry 1/1, Gold NFL Shield 1/1. 20 cards. Serial numbered #/199. Shop on eBay. PARALLEL CARDS: Purple #/99, Orange Patch #/49, Teal Patch #/25, Red Patch #/10, Green NFL Shield Tag 1/1, Blue Size Tag 1/1, Gold NFL Shield 1/1. PARALLEL CARDS: Blue #/25 or less, Green #/10 or less, Gold 1/1. PARALLEL CARDS: Blue #/10 (Howard - #/25, Janovich - #/15), Gold 1/1. *Keanu Neal only in parallels; Jalen Ramsey, Kenyan Drake only in Green/Gold parallels; Leonard Floyd only in Gold parallel. 15 cards. Serial numbered #/25. Shop on eBay. PARALLEL CARDS: Patch Green #/10, Tag Gold 1/1. See the full design breakdown for 2017 Panini Unparalleled Football. Can someone explain why the 2016 draft class are rookies in the 2017 Unparalleled as well as the 2016 release? The 2016 rookies will not be shown as rookies again in 2017. As noted with the gallery, those are just mock-ups that will be updated. 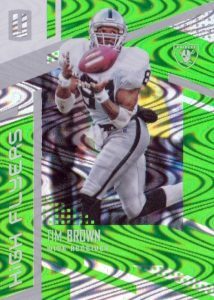 3 hit box with nice color and plenty of parallels for less than 100 bucks. My kind of stuff. I got the Donald/Quinn Perfect Pairs 1/1 out of a rather surprising Rams PYT GB but it looks like patches, not tags. Don’t understand why I have a large stack of cards that say “rookies” even though they are not. The best ones are….Darian Stewart, Kurt Coleman, Junior Galette, Will Tukuafu, and Thee Best Richie Incognito!!!!!! I like the product, but really wish they would have QC’d some of the “RC”. As Matt Hinkes says, I also have a Richie Incognito “RC” when he is clearly not a rookie. Erik/Matt: When Panini announced this product, they said that many options in the base set would be for players who never had base cards before. 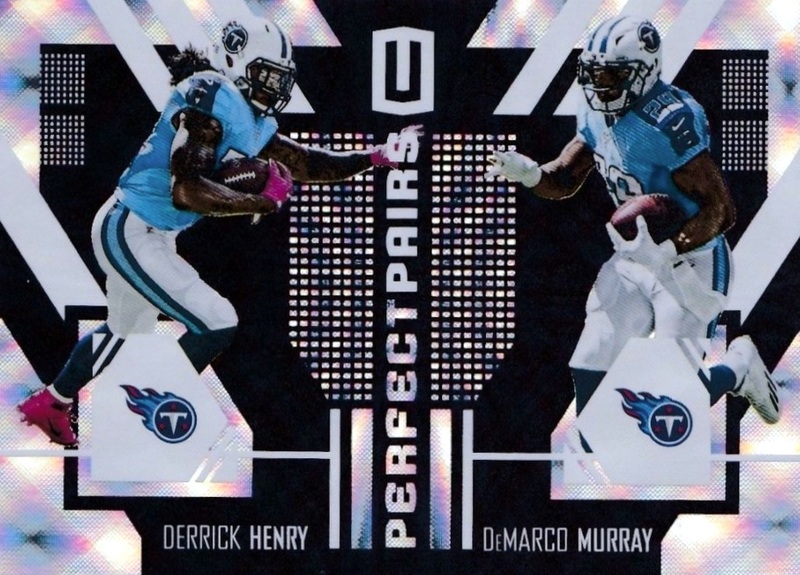 Apparently they took that a step further by actually putting the RC logo on these cards despite them not being anything close to actual rookies. Great looking product. Sick patch, nice rookies, no complaints here. 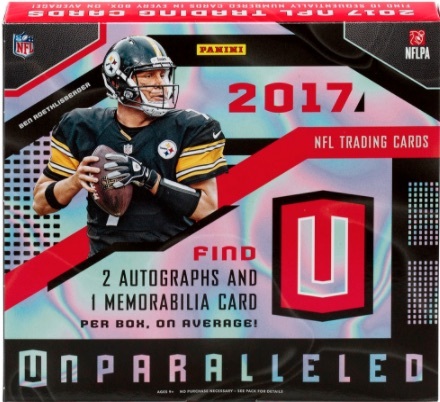 2017 Panini Unparalleled Football Hobby Box SEALED (2 auto. per box) - Mahomes?